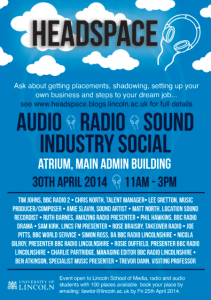 Over 100 Audio and Media Production students gathered for HEADSPACE, a unique industry social event at Lincoln University on Weds 30th April. The gathering was organised by Senior Lecturer in Radio, Zara Healy. 16 industry professionals, including 6 graduates from the radio, audio and music industries attended the event. They included Tim Johns, who produces Jeremy Vine’s show on BBC Radio 2, Chris North, a Talent Manager who has represented Greg James and Scott Mills, Sound Artist Amie Slavin, and presenters from the BBC and Commercial Radio. Four Q and A sessions allowed students to set the agenda and ask any question about careers, getting a foot in the door or setting up their own companies. 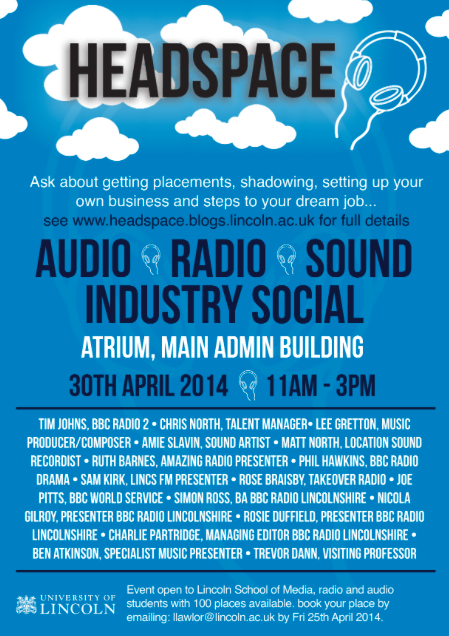 The aim of the day was to get students mixing with industry contacts and gain honest, helpful advice. The result was a packed and really useful day, which ended in the Shed Pub for a drink and more discussion. Zara Healy said “We have great contacts with the industry and HEADSPACE was a chance for people to get together, socialise and celebrate this. I hope this event is the start of more social gatherings in the future”. Thank you to Brayford Radio for helping host the guests and Dr Sarah Barrow, Head of the School of Media for funding it.